The response of President Vladimir Putin to this month’s killings in Paris was immediate and unequivocal; so too Foreign Minister Sergey Lavrov (image, left). But on receiving French President Francois Hollande’s invitation to participate in the head of state, head of government demonstration in Paris on January 11. Putin declined, and Prime Minister Dmitry Medvedev (right) was not sent in his place. 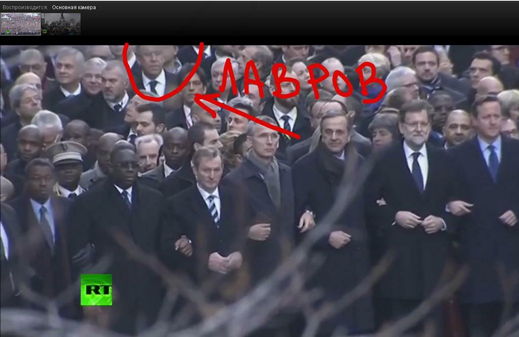 The substitution of Lavrov has not been noticed or explained in the Russian media. 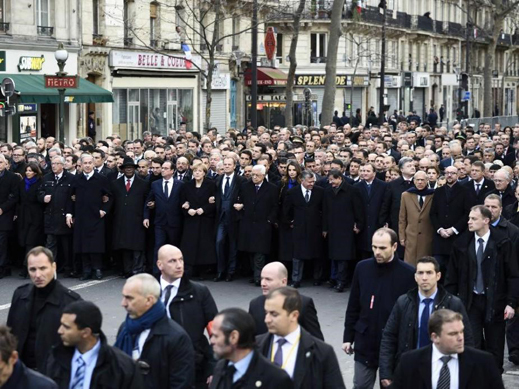 The Russian response to the Charlie Hebdo demonstration wasn’t as absent the US government’s. 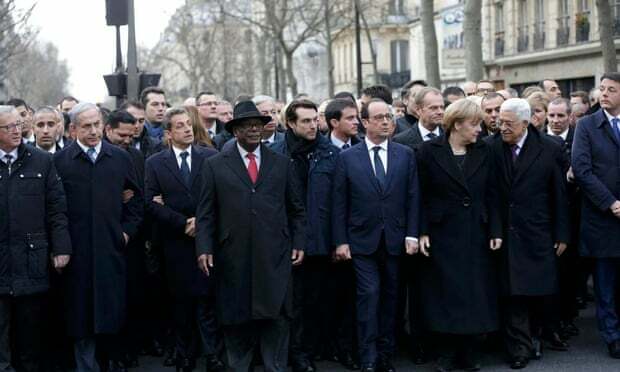 No high US official participated in Sunday’s demonstration: Eric Holder, the US Attorney-General, was in Paris on the day, but not on the street. The only US representation there was the newly appointed US Ambassador to France, Jane Hartley, a money-raiser for President Barack Obama’s election campaigns. 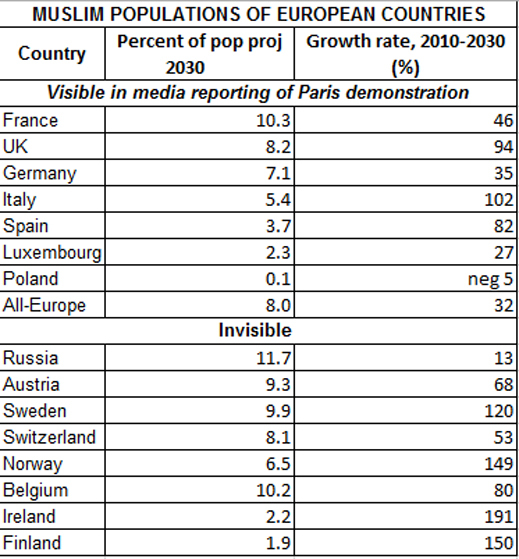 Medvedev said nothing. Three weeks before, he had issued his “deepest condolences over the brutal terrorist attack on a Peshawar school that resulted in numerous civilian casualties. We resolutely condemn this barbaric attack and support the Pakistani people in their uncompromising struggle against extremism.” That was on December 17. 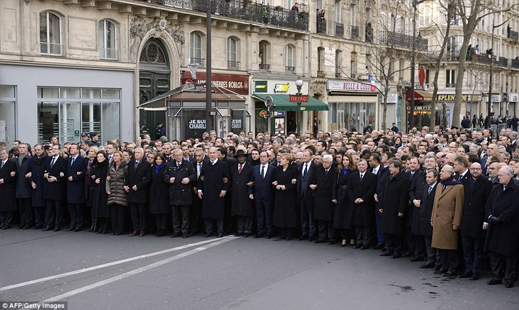 Medvedev was silent on January 7, when the Paris attacks began. On January 9, when they ended, Medvedev announced from his dacha that he was holding a meeting to discuss housing and communal services. 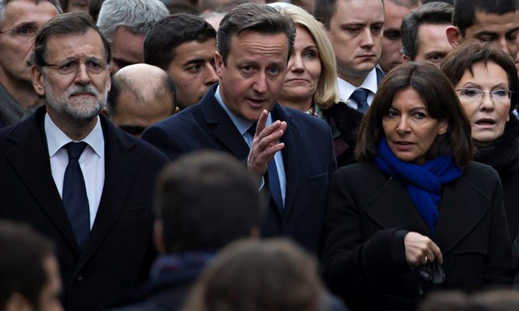 Depending on which countries the media were reporting to, published photographs of the Paris demonstration emphasized the local boy or girl, such as this one from the London Guardian, making it appear that Prime Minister David Cameron was pointing the way to the Mayor of Paris, Anne Hidalgo, while the Prime Minister of Spain, Mariano Rajoy, expressed his uncertainty on the point, along with the Danish and Polish prime ministers behind Cameron to the right. The film records are more revealing. Look carefully at this clip, broadcast by Ukraine Today in Kiev; this medium is owned by Igor Kolomoisky. At the 4th second, an unidentified hand can be seen pushing Mahmoud Abbas, the President of the Palestinian National Authority, away from the position he had taken right beside German Chancellor Angela Merkel. 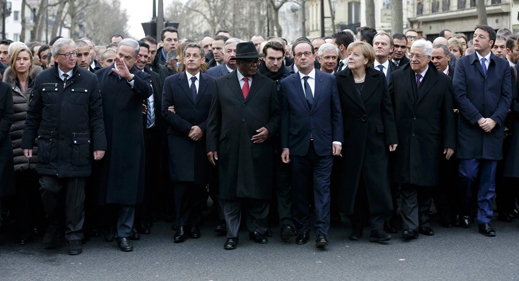 The hand also moves Ukrainian President Petro Poroshenko to a front-row position. And here is a shot of the positioning afterwards: Donald Tusk, the Polish President of the European Council has stepped from the second row to the first, and is now between Merkel and Abbas, with Poroshenko three places to Abbas’s left, looking further to his left. Jordan’s King Abdullah II has kept his place, but his Queen Rania has been relegated to the row behind them. There has been no comment from Medvedev’s office or from his political supporters to allay the suspicion in Moscow that he is not trusted to stand in for Putin with the leaders of the US and European Union. 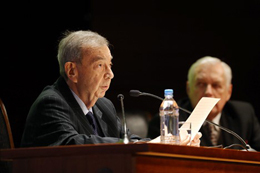 Primakov is referring to the fact that at present, and according to projected growth of the Muslim populations of the European states, Russia has the largest number in absolute terms; more than one-third proportionally — and more than the Muslim populations of the UK, France, Germany, Spain, and Italy combined.